We were very lucky to get home and have a wide variety of visitors from many places. The lovely Danille came from Indiana (sad, no photos of her, and most of the time I had to spend with her I was asleep on the couch due to my lovely sleep deprivation. Sad, sad). Sue Anne is here from Scotland working at the U of U for a while. We got to spend some birthday time with her, first, helping her assemble an amazing wedding cake and second, eating pizza and a special SAZ grape pie. Fun also to see Christina, Danny, and Eric. Only Susan could have made the day better. Brian takes his pie crust very seriously, and this was some seriously good pie. My mom put together the grape pie filling since it is one of our favorites and we were in Poland during the grape harvest. We had been saving it for Sue Anne's birthday ever since we found out she would be in Utah during her birth month. If you ever have a chance to make or eat a grape pie, do not hesitate. 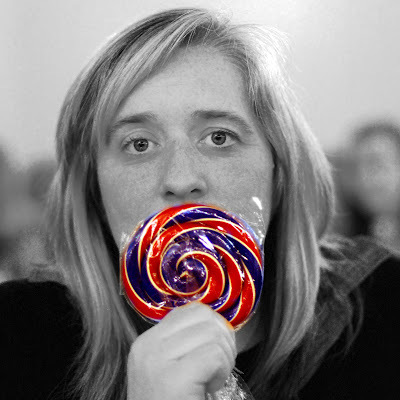 If only we could have taken her to the candy factory in Denver. We did this portrait of her a couple years back. SAZ's extreme talent does not seem to fall too far from the tree. Her mom made this amazing window for her. This is only her second stained glass window. How awesome is that? I could maybe make a tic tac toe stained glass window, maybe. We were also lucky to see Sue Anne's lovely California family. We rented a crazy house near their home when Brian was working with Opera Pacific in 2008 and they are a really great family. Thanks for playing Zollingers! It has been really fun to see everyone! A couple last photos from Denver, when both kids were wearing their fishermen sweaters (from Aunt Mary). I love the study in my children's hair color. We need to work on a sibling shot. Staying still for a cute photo together is a little complicated for a 1 and 4 year old. Jane enjoys some outside time. We arrived home safely late Monday night after some bad roads through Wyoming. We stopped and got two new tires in Rock Springs. As much as we grow to love places we visit, we love to be home. Brian has been further preparing for his new role (starting tomorrow, the Italian Girl in Algiers with Utah Opera). Jane has learned one of his arias also and sings right along. She is an outside girl. We have had some ok weather for good play times. Colin thought it was hilarious to get cracker crumbs in his clean hair from this bowl. He got a Batman sticker from the doctor for his well child check. At the doctor, Colin requested a shot (although none were required). I think his main motivation was a lolly pop that the MA provides post-shot. He is a great little doctor guy. Jane makes up for his goodness by being a complete doctor nightmare. This little girl seems to know something we don't. 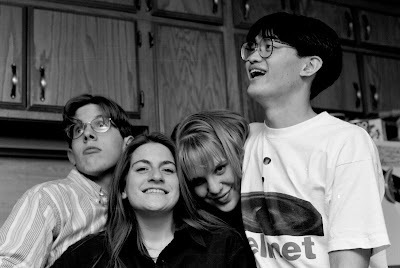 1994 with Brian, Gretchen, and Ted. I left voice messages for both Ted's family and Gretchen today. We are so lucky to have close friends from a long time ago. Ted is going to kill me if he sees this. 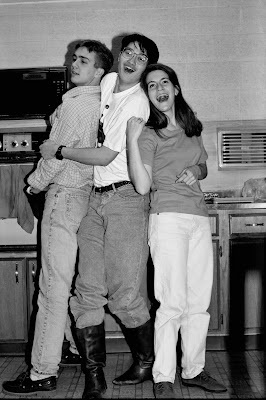 In the photo, for some reason he had put on my boots and was performing a musical theatre number with Gretchen while Jeff was trying to cook dinner. Somehow Jeff doesn't seem anxious to join in. All through college I had an enlargement of this photo in our apartments that embarrassed Ted. Sorry, but the photo still makes me giggle. For a photography class in 1994 I did a portrait series of Brian. This photo was taken at Utah Lake. 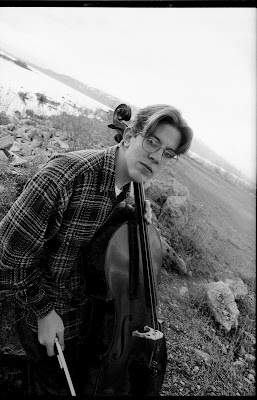 Here is a youtube clip from Brian's cello career where he is practicing with a trio for a chamber music competition. 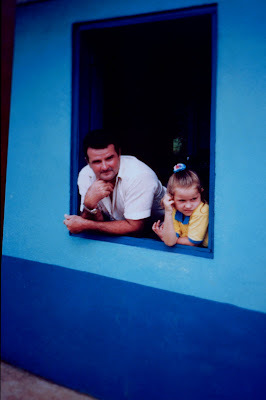 Checking out how the scanner handles positive images, a slide from Costa Rica in 1993. It was a photo, then I made it into a slide for outreach presentations I used to do about Coast Rica in local schools. I always liked this photo. Anyhow. . . just wasting time doing things that do not really need to get done, but happy about the scanner (much better quality than I have gotten from my flatbed scanner). My dad has thousands of slides that I hope to make digital copies of to see a little more of his world. 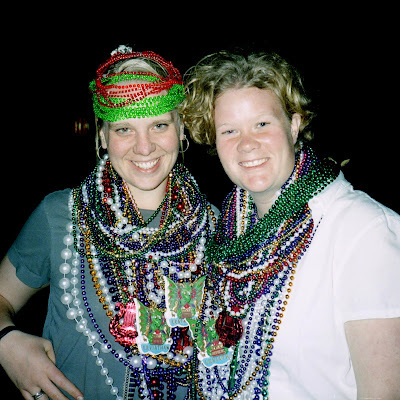 10 years ago, my friend Emily and I traveled down to New Orleans to celebrate Mardi Gras. I turned 25 in New Orleans. We had a great time and got lots of beads. And since we do not drink, we feel we were among the few who really saw Mardi Gras 2000. On Fat Tuesday we left Bourbon Street by about 5pm because we had seen enough public urination. This year for my birthday, I am taking Colin and Jane to Philadelphia to spend some time with my old college roommate since her husband will be away. It will be Kristy and I vs. 5 kids. It will probably be just as crazy as Mardi Gras, if not more crazy. Near the end of our Denver stay (we are home now, and I am on a marathon of laundry-doing) Jane was pretty cute trying to put on her shirt. She loves the polka dots and calls them "balls". In other Jane news, she is trying so hard to string as many words together as she can, it is very darling. Guess Jane should have been the child with us in Israel. I was always too chicken to take pictures of people too directly. 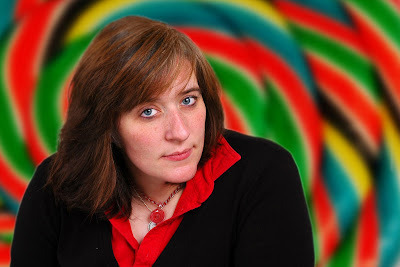 Here is a link to another handful of photos of people I was too embarrassed to photograph overtly. Anyone want to fold my laundry? Our host here with Opera Colorado kindly arranged for us to attend the student matinee of the Barber of Seville as a family. 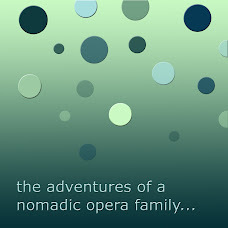 Colin went to a run through of this opera as a 4 month old at Glimmerglass, but has not been to the opera since. He was being his contrary self walking over to the theatre, not wanting to go. He was cute because after the act 1 finale, he wanted to see it again. Jane was cute because as they dimmed the lights, she folded her arms for a prayer. Our host lined us up with a nice box to sit in, so Jane and I sat on the floor for a while and watched Dora on the portable dvd player. Jane did very much enjoy the clapping parts. A couple of times when Rosina was singing, she was spinning around. The young student audience was amusing. When the chandelier dimmed they were all very excited. Once the word damn came up on the subtitles and it got a good giggle. Brian did some student performances of Barber in Dallas a few years back. The curtain call was very funny at those shows because with every chance to clap, the kids clapped and screamed all they could, then quiet, then screaming again for the next person. Brian and the kids with Marrianne. She and her husband have been our hosts. One more orange haired wig photo of Brian. The wig and make-up lady likes to hold his wig in piggy tails to make everyone want frosties. I got to go to the show again last night with my mom, aunt and cousins. It is a very fun show and great cast. We just had a little gnocchi fest with some of the cast, yum. One more production photo, by Matthew Staver. Brian get to spend the first part of the opera in this beautiful blue leather coat, just to show he is not always in an orange wig. 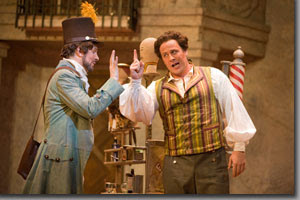 Also pictured is Lucas Meachan as Figaro. Good times. Our sweet little Valentine last year. Since Brian has his last show on Valentine's and then we are driving home, we will celebrate next week sometime. For years before Brian and I were even dating I had a Valentine tradition of professing my love in a note every February. They are very funny to read now. Lucky we got married or I would (and should) be very embarrassed. Novelty suckers courtesy of Nana's birthday box to Colin. Our time in Denver has been a time of huge lolly pops. Some photos we forgot to post from our Polish Fall. Here are some beautiful interiors that Brian took one day when he was rehearsing in a different area of of the Grand Theatre. It is too bad we did not get to walk through these everyday to get to our apartment. The opening night reception was held on the mezzanine up here, so we could see those beautiful chandeliers up close. They were amazing. The Monument to the Jewish Ghetto of Warsaw. We regularly walked in the area that was the Ghetto. WWII is much more real to us now. On Colin's birthday eve (the day of his cake party) he got a big birthday box from Nana. 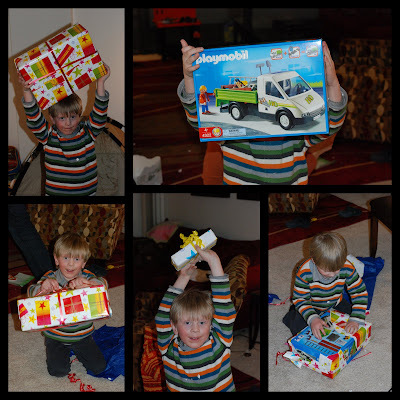 Very fun to get a big box with presents. Colin on his birthday morning, getting ready to open Mommy and Daddy gifts. He is just a little excited. We still love Dora and Diego. Jane can even count in Spanish. Since Jane got Dora's backpack for Christmas, he wanted to get Diego's rescue pack. We had to talk to him a few times before his birthday to re-enforce that it was just back pack. In Diego's show rescue pack can turn into lots of clever things and that was what he really wanted. He was happy all the same. Jane with left over yogurt face. She also has enjoyed the birthday weekend. I did not bring the camera, but for lunch on Colin's birthday, we went to Casa Bonita. Jane was a nightmare getting our food but settled down when we were seated. After the first cliff diver, Colin asked the simple and profound question of "Why?" He enjoyed when there was fire juggling and then diving, and he was just as excited to go to the dollar store after lunch.